The band were on tour and had a couple of days in Stockholm – not a lot of time left before mixing started, so it had to be recorded while on tour. 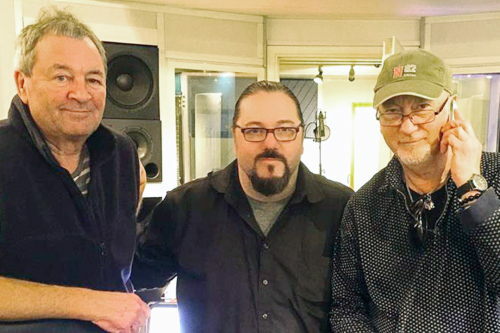 I got to record Ian’s vocals together with Roger Glover, and additional keyboards with Don Airey. But then Roger says, ‘We’re missing one guitar chord on this song. Bob says, ‘You’re a great player, so you can do it!’ As I walk to my room in the studio to grab my guitar and amp, I just laugh loud in my head. I quickly copy Steve Morse’s sound and add three first-take dubs that sound perfect. I was done in less than a minute! …Nothing can ever be cooler or funnier than getting to play one chord on a Deep Purple album. Thanks to Ultimate Classic Rock and Nigel Young for the info. Posted by Nick Soveiko on Wednesday, April 5th, 2017, filed under News. You can follow comment on this post through the RSS 2.0 feed. You can skip to the end and leave a comment. Pinging is currently not allowed. But it is possibly the most important chord on the whole album!. 🙂 I wonder if he’ll get a credit. additional Recording at X-level Studios Stockhom Sweden. Also listed in the additional recording section are Doron Plascow, Bob Ezrin, and Piers Mortimor. Finally this story came to the light. Almost a year ago the guy, Denander, published the story, without mentioning it was just one chord, on his Facebook profile. In less than a day he was asked to remove completely the post and the comments. But what Mathias published is totally true. I am really not happy with this kind of news. @8 I don’t understand why you’re unhappy with him recording just one chord?